The package consists of a pair of gloves (obviously), a junior controller with leads, a battery lead with inline fuse holder and a big bag of different fuses. Installation is pretty straight forward: first choose the appropriate fuse, then screw the battery lead to the battery and thread the plug out under seat to somewhere convenient. 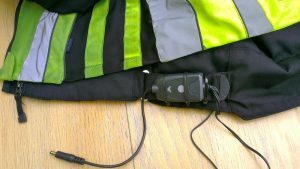 Then thread the junior controller leads through your jackets arms and attach the control box to the jacket waist (see pic left). 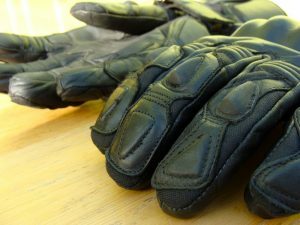 Now, when setting off, it’s easiest to plug the gloves into the wires hanging out of your sleeves before putting the gloves on. Then sit on bike and plug control box into battery lead. Press button and go! The controller box button cycles between 4 levels of heat, with a different colour light indicating which is selected. The gloves get lovely and warm, the backs of the hand more so than the fingers, but numb fingers are definitely a thing of the past. The construction of the gloves is very good, a mixture of real leather and textile, with plenty of armour protection on knuckles, tops of fingers and round wrist. There’s also extra padding on the palm, which is where you really need it, should you come off. 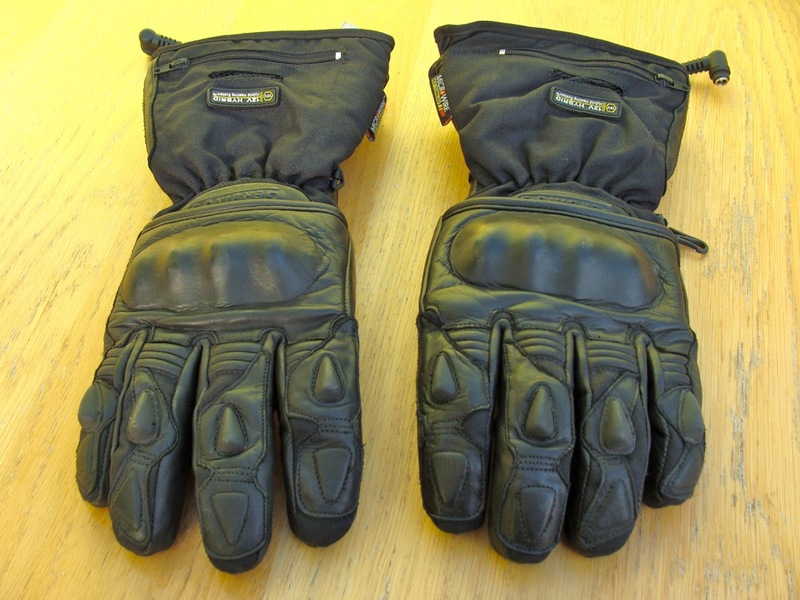 In fact, the gloves are pretty warm in their own right, about on par with my Alpinestar Jet Road and better than my older Hein Gerike Pathan gloves. Out of the box, you are warned the gloves aren’t waterproof and need treating to make them such. OK, a bit annoying, but a dose of Nikwax soon fixes this. The Nikwax did make the palms a bit slippery at first, but was fine after a day or two. I’ve had no leaks of soggy hands since though. One downside, is they have no ‘wipe’ blade on them, for wiping your visor clear. In conclusion, yes they’re expensive, yes they are a little fiddly to plug in before setting off. But, warm fingers make such a difference, you can shrug off the crap weather, you can concentrate on riding without the distraction of painful fingers and get back to enjoying your time on the bike. If you plan to commute through the coming winter, I can whole heartedly recommend these gloves. Epilogue: I’ve had these gloves for 4 months now, but there are some serious questions of reliability hanging over them. In that time I’ve been through three controllers and one glove has stopped heating up completely. Read my recent post on Gerbing reliability here. Epilogue (2): Gerbing’s replaced this 2012 model with the later 2013 model, with a large number of improvements. But best of all, they have lasted use everyday over the 6 months through the winter without any reliability concerns. Read my more recent post on Gerbing’s New Features. 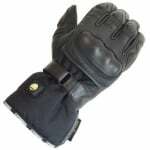 Just come across your site after searching for people who have fitted these gloves. Was wondering how you secured the junior controller to the waist of the jacket. Did you have to rig something up? You’re right, it’s not clear from my review how this is done. I’ve added a photo of the controller fastened to my jacket, so you get an idea of the setup. I’ve just wrapped three cable ties around the controller and the waist adjustment strap of my jacket. The leads are then threaded inside my jacket, between the removal winter liner and the jacket, to poke out a couple of inches at each wrist. 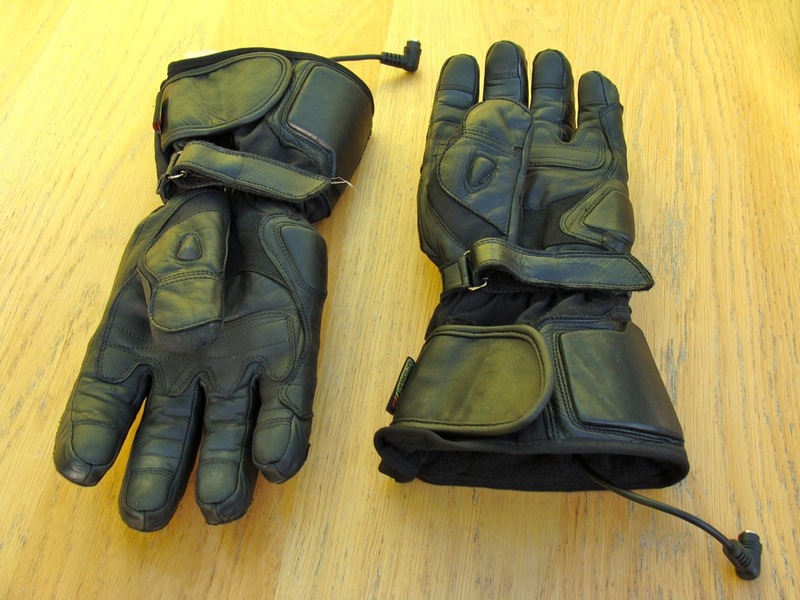 The Gerbings gloves can be rigged to thread the wires out on the inside of the gloves, or through a zip on the outside. This gives you flexibility if you’d rather thread the wire along the outside of your jacket. The wire hanging down from the controller is then plugged into the battery wire I leave hanging out from under seat. I leave the controller in-situ on my jacket all winter, then it only takes me a minute to plug gloves in at wrists and controller at waist when setting off. The latest controller doesn’t even need turning on each time, it remember last used setting.